In technical mountaineering, how do you decide when the effort is no longer worth the risk and reward? Yes, it is true. I am giving up technical climbing. I am NOT giving up non-technical mountain climbing, I am just giving up the technical aspect with climbing ropes. I still love the Colorado Mountains, and would not trade summiting them for anything. That is, for as long as I am able. Why am I giving up the technical aspect of mountaineering with ropes? As I write this, I am 53 years old. I took up rock climbing about 15 years ago, to gain summits that required technical climbing skills and more importantly, to help me release my fear of exposure. I wanted to push myself to my edge, learn to accept this edge and grow… and I did. 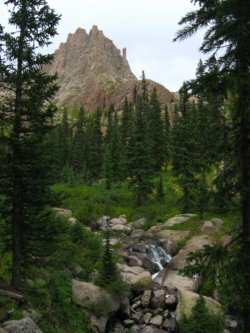 I wanted to summit the top 100 peaks, called the "Centennials" of the Colorado Mountains. 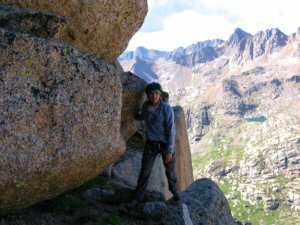 I have only achieved the summit of three technical mountaineering routes, all in the Colorado Mountains: Teakettle Peak, Dallas Peak and now more recently, Jagged Mountain. I did all but one in my 50’s. But now it is time to retire my personal climbing ropes. There comes a time in all of us that we realize the effort is just not worth the price we have to pay. In September of 2011, on a beautiful Labor Day weekend, I gained the summit of my last technical mountain. I was relieved, ecstatic, exhausted and grateful all rolled up together. The emotional high was like none other. I could now realize my dream of finishing the Centennials in my lifetime, with only 9 more non-technical summits to go. In the world of mountaineering this is not a big deal. But for me personally, it was! The final nine Colorado Mountains will have exposure and will have almost the same thrills. I know this because five of them are in the remote, rugged San Juans. I have been on top of many Colorado Mountains, and I will be again, just not with ropes. I will continue to rock climb on rock walls that require limited approaches. This is sport climbing and I still plan to keep myself young and active doing this activity. How did I arrive at my decision? How did I know that it was finally time? Is this easy for me to say since climbing season is now over? Will I change my mind when next year rolls around? I doubt it. Here is my story. 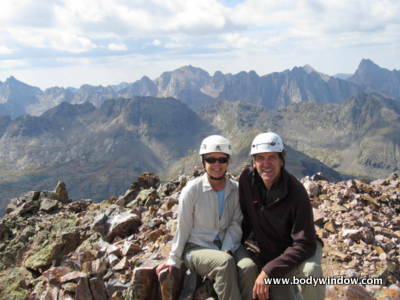 It is all about a rugged peak in the heart of the San Juan Mountains of Colorado, call Jagged Mountain. It is a long story, so grab a cup of tea. 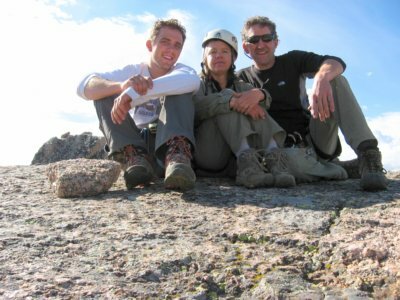 I had attempted to climb Jagged Mountain, 13,824 ft, several times before, with my husband and different friends. Both times we were stormed out of the mountains. The first time we never even reached 11,000 ft, due to the downpour. We gave up and hiked out. The second attempt, we got higher, to 12,700 ft to the base of the mountain when it started to hail. Down trodden, our mountaineering adventure thwarted, we hiked out again. The third time had to be successful. 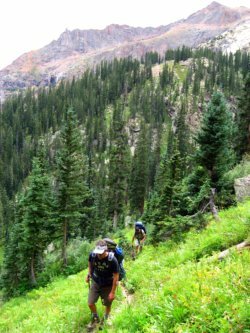 The approach to Jagged Mountain takes 1-2 days and the hiking with heavy packs up and down passes on steep and rugged terrain wasn’t easy. I didn’t think I would be up to the effort for the fourth time if we were not successful. I doubted I had the heart to do it again. The sojourn started on the Thursday night before the holiday weekend as our party of four traveled from Denver, CO and drove the 5 hours to the west end of the Rio Grande Reservoir, near Creede. It was 11 p.m. by the time we set up a car camping site. We hunkered down for the short night. Friday morning 6 a.m. came quickly and we gathered our gear for the long, rough 4WD road ahead to the Beartown Trailhead. About 1 hour into the drive, on Timber Hill, we hit a rock with our truck and we heard the unmistakable sound of air hissing out of a tire. We stopped, looked for the flat tire. Alex, my stepson was the first to notice, and said, "We have TWO flat tires!" Yes, indeed, both tires on the right side were flat as pancakes. The rock we hit had somehow managed to slice the sidewall of both tires. Incredible! I tried not to be too emotional as our friend said, "Well looks like you are not destined to summit Jagged." My husband stomped off to look at the guilty rock. Since we only had one spare tire, and the 4WD road was quite narrow, we changed one of the flats with the spare, and slowly pulled off to the side of the road. Now what were we going to do? The only choice was to wait and see what came along. Within a matter of minutes, a single woman in an SUV came along, heading up to the road. We stopped her, and she was a dear soul. She heard the story, saw the flat tires and actually volunteered to drive us to Creede, the nearest town, only about 30 miles away, but about a 2-3 hour drive over rough roads, to repair a tire to replace the 2nd flat. Turns out she was heading to the same trailhead at Beartown! Our new friend was planning another mountaineering adventure by herself. She had already conquered Jagged Mountain, several years ago! She was willing to alter her own plans to come to our aid. She was truly an Angel. My husband and stepson, along with an injured tire, climbed into her vehicle as our friend and I settled in for the long wait. About two and a half hours later, our Angel returned alone in her 4WD. 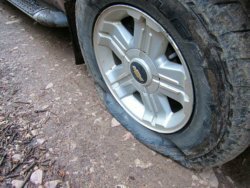 She had found a volunteer and his wife at a small holiday village by the Rio Grande Reservoir to drive my husband and stepson to Creede in search of a tire. She went along on her way to her solitary adventure, delayed by only a few hours. Several more hours passed, when about 2:30 pm along came the volunteer and his wife, with the two men, and a very passable used tire. We thanked them whole-heartedly and soon had the 2nd flat tire changed. We were able to get to the trailhead about one hour later, and were hiking with heavy backpacks by 4 pm. Our plan to reach a high camp at 12,000 ft by dark was now gone. We did manage to stumble onto a campsite, over Hunchback Pass just before dark, at 7:30 pm in time to set up camp before blackness arrived. We had managed to clock in about five and a half miles, instead of the nine and a half we were hoping for. 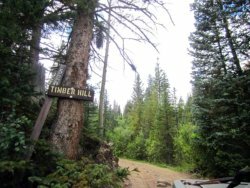 We were four and half miles down the Vallecito Trail at the Rock Creek Trailhead intersection. Who do you suppose was camping just across the trail from us? Our Mountaineering Angel and first rescuer! Amazing! She had actually taken the campsite that we had remembered from our prior trips. She came over immediately and was very interested in our well-being. She knew the story of our prior attempts on Jagged Mountain and having attained the summit herself, knew what it meant. She even gave us two quarts of filtered water, so I could begin cooking dinner right away before total darkness fell. What an Angel! 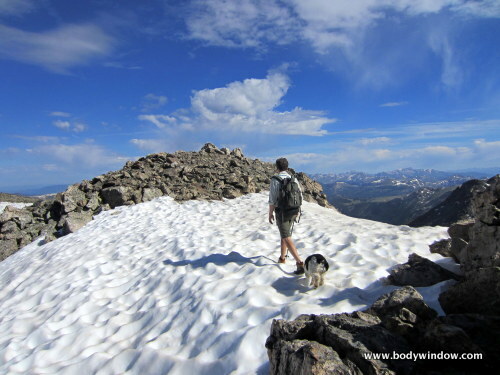 Our new plan for Saturday was to sleep a little longer and reach the high camp just above 12,000 feet, near tree-line. If the weather held, and we were quick with the next four miles, we would maybe attempt the summit that day. 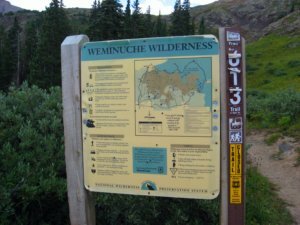 As it turned out, the trail to high camp, up the Sunlight drainage was rough and steep, attaining about 3000 feet. We arrived at high camp about one in the afternoon, and the sky was not all that clear. We made the decision to hang out at camp until Sunday morning to attempt the summit. It is a good thing we made this decision: It was the right one! "It's always further than it looks. It's always taller than it looks. And it's always harder than it looks." ~ The 3 rules of mountaineering, author unknown. We awakened at 04:45, well rested and excited for the day. I had hardly slept during the night. The climb, is rated a 5.0 – 5.2, barely even a technical climb, but I had studied the route, saw the trip pictures of others, and was anxious. Yet I kept telling myself, this will be no problem. We set off at 05:30 for the one and one half mile remaining to the summit. 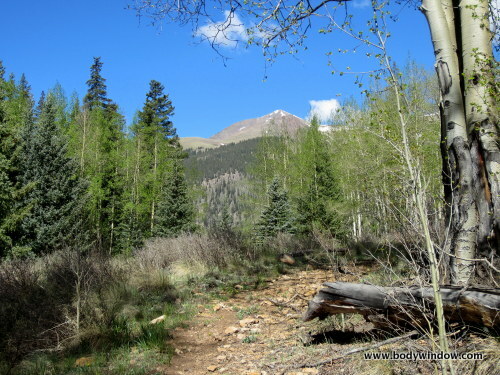 We ascended the steep slopes around the East face of Jagged Mountain. 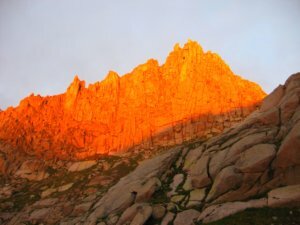 The alpenglow was stunningly beautiful as we sweated in the early morning light. We reached a small bow lake at 12,700 ft. and peered up the north face of Jagged Mountain. The climbing route was just to the right of the prominent culoir. The climbing route was on the North Face. We had only one half mile to go, 3 cruxes (technical sections requiring climbing ropes) and about 1100 feet. We geared up at the base of the north face, placing harnesses and helmets. The excitement mounted. We re-read Gerry Roach's approach route. We ate some trail mix as we breathed deeply and studied the route. We began the climb. After climbing above some rocky slabs, we came to the first crux. My husband went up the 10 foot crack, no climbing rope, no problem. My stepson went next – no problem. I went next and the crack was wet, and not being as strong nor with as far a reach, got stuck, climbed down and requested to go on belay with a climbing rope. My husband tied in, threw down the rope and up I climbed on the safety of the belay. Our friend went next, on belay as well. At the top of the first crux, on a nice grassy ledge, the route started to look more intense. Our friend, who had limited climbing ability, stated that he was exhausted, that the climb looked above his skill level, and that he no longer had the heart to carry on. We tried to convince him that it didn’t get harder, but he was determined to retreat. We thanked him for his honesty and my husband belayed him back down the first crux, where he could return to camp. The three of us – my husband, my stepson and I pressed on. The zig-zag climb up grassy ledges from here was exposed and exciting. We had to continuously find the route, through well-worn steps on the ledges. We up-climbed then down-climbed, over a wet, slick and exposed gully to the 2nd crux. All three of us went up the second crux, without climbing ropes. I needed just a small boost on the bum from my husband below, but no rope necessary. We climbed up more steep and exposed grassy ledges, to the 3rd crux. Again, we all made it without a climbing rope. My stepson would go first, a very strong climber, then I went, followed by my husband, also a very strong in mountaineering. I felt very safe with this arrangement, sandwiched between 2 strong climbers. Finally, we reached the top of the notch on the ridge that defined the way. Through the notch to the south face to the famous ledges we went. The south ledge is severely exposed, and some teams rope up here. I honestly don’t know how they would do it. A rope would seem cumbersome and I just carefully worked my way through it, and across the famous, exposed "step-over." It's exposed indeed, but not difficult. We arrived at the sandy, wider ledge, and looked up at the final class 3 chimney. The chimney was un-exposed, with lots of hand and footholds. I wedged myself up it with ease, to the final rock blocks just before the summit! I arrived behind my stepson, and heard him whoop! We had made it! The sky was clear and it was 11:17. We were on the summit before noon – the first mountaineering rule. It had taken us over five and a half hours to reach the summit from high camp. We stayed only about fifteen minutes on the summit, as noon was approaching, clouds were building and I did not want to tempt the mountaineering gods! A wet descent would be a whole 'nuther ballgame! Stepson, Alex, myself and my husband, Rich, on the Summit! We took heart, because we had read that Jagged Mountain is the only mountaineering route that is easier to down-climb than up-climb. It turned out to be true for us. We did use ropes to rappel all three cruxes, as it was much more dicey looking from above! Plus it was faster to rappel. As we were setting up the rappel on the second crux, it started to snow on us! But it turned out to be not much, and did not add to the difficulties. As we rappelled down the final mountaineering crux, we noted thunderheads off to the East that had built up after passing over Jagged Mountain. We were safe and we were grateful! We had done it and we had done it well! 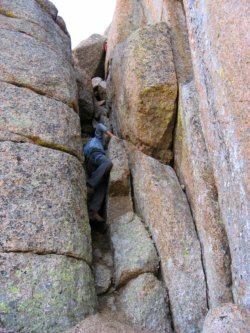 We scurried down the steep remainder of the north face of Jagged Mountain, and removed our mountaineering gear. Onward down the steep rocky slopes to high camp. Sure enough, the down climb was easier and we arrived at high camp at 2 pm, taking half the time to descend as to ascend. All-in-all, the round trip to the summit took us eight and one-half hours! I was so glad that we had not attempted it at 2 p.m. on the day before, or darkness would have prevented us from attaining the summit! Our friend was waiting for us at camp, after spending the day in the high meadows and ridges, enjoying his own brand of excursion. We ate a lot and rested awhile, and broke camp. We were on the trail again by 3 pm, to get to the low, intermediate camp where we camped the night before, before dark. We slid down the steep slopes and out the Sunlight drainage, hopping over the tree fall from a recent avalanche, with now-lighter backpacks. We made it to low camp in a mere three and a half hours. Who did we meet up with on the final mile to low camp??? Our guardian angel! She was just completing her second mountain, Peak 15 and heading back to her same camp. We hoped to find the same spot ourselves, again, across from hers! She made the final mile to camp go much faster, as we chatted about our adventures. 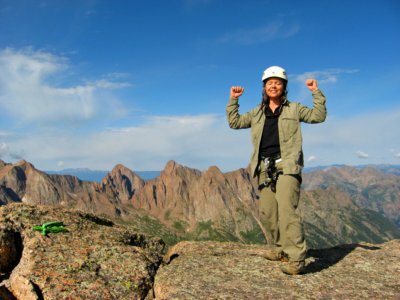 She is an amazing person, mountaineering by herself!! I was so grateful to have the diversion of her conversation for the last mile, as I was exhausted from the long hike with the backpack. On the final morning, Labor Day Monday, we broke camp for the last time and talked to our Guardian Angel. She was planning a summit of Hunchback Mountain, before heading out. She told us she would be behind us on the 4WD road out, and she would keep an eye out for us, since we would be "spare-less." We profusely thanked her, once again, for being our Guardian Angel. We were truly blessed. We made it back to the trailhead by 11:00 and toasted our success with a cold beer waiting for us in the cooler. I was very emotional, when I saw the truck of our Guardian Angel. Without her, I would not have been able to realize my dream. Tears came to my eyes as I looked at the note my stepson put on her windshield wiper blade, thanking her for her kindness. I hugged my husband and my stepson, thanking them for the assistance and comfort they had supplied me on the mountaineering route. It was a special time for me, filled with synchronicity, gratitude and peace. We drove out the rough road without incident, knowing that our Guardian Angel would come along should we need her. We stopped in Creede for a quick meal, of a large, greasy hamburger, and coffee for the long drive back to Denver. It took me several days to recover after this trip. My body was surprisingly without too many aches, but the aches I did have were deeper. I was no longer going to push myself like this ever again. 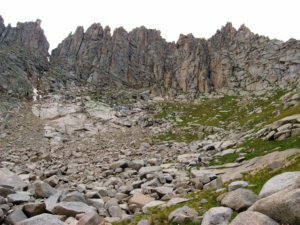 It took a full 22 ½ hours of moving time and four days to complete our tour of Jagged Mountain, through rough, steep and mountaineering terrain. 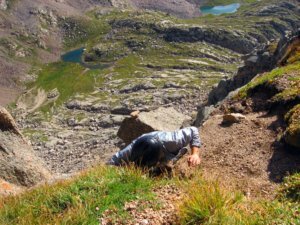 My husband, carrying the climbing rope and heavy protective gear had the biggest burden of all of us. 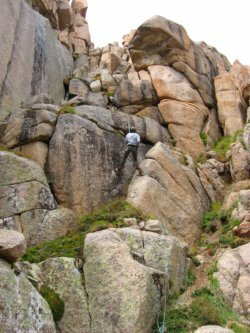 I remember how I could hear the anxiety in his voice as he called to me while on the mountain, to give slack or tension to the climbing rope. I knew that he felt that the safety of his wife and child was in his hands, during our climb. I did not want to put that burden on him again. Due to the extraordinary level of exertion that my husband expended, he was also urinating blood. It can happen with extreme exercise. This symptom was the final deciding factor, that I would never do this to him again. If it weren’t for me and for my Centennial goal, I doubt he would have put himself through this. He did it for me. For now, at least, at the end of a long summer of climbing, I am retiring my personal climbing rope and my mountaineering boots. I have made my final summit with ropes. An older friend, who has many years of his own mountaineering experiences to reflect upon, said to us, "Looks like you have had a true mountaineering experience with this one (Jagged Mountain). It will cure you of complacency forever!" And of course, he is right. Climbing Jagged Peak was a true mountaineering experience and perhaps the best mountaineering route in all of Colorado; one that never let up in intensity; one I will cherish forever. But technical mountaineering is over for me. There are many Colorado Mountains to climb and vistas to ponder that will not place my spirit in such stress. I am even sporting a cold sore as I write! It is no coincidence, that one year ago, almost to the exact date of our summit, my father passed away. I couldn’t help but believe, as my mind traveled to him and his life many times along the trail, that he had sent our Guardian Angel. How else would we have completed the 3rd attempt on Jagged Mountain? How else would such synchronicity of events have occurred to make our climb the safest possible? It was a small miracle, that in the wet San Juan Mountains, it didn’t rain at all for four days! From whom did I get my determined spirit? In Loving Memory always, I dedicate my final technical mountaineering climb to the Spirit of my Father.